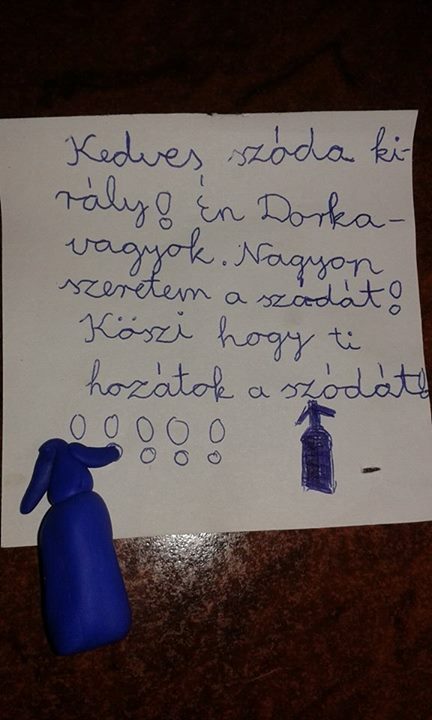 Szodakirály Kft. = Sodaking Ltd. / Sodakönig Gmbh. We make bottled carbonated water. This means the traditionally sodawater, selzter or “szikvíz”. This high pressured carbon dioxid give the water a special sour, fress taste and antibacterisierd to. Soda water is a “Hungaricum”. More than 150 years makes soda water in Hungary. 66% of the population drinks sodawater in Hungary. Soda water was invented by Ányos Jedlik, a teacher at the Benedictine secondary school in Győr. The scientist got seriously engaged in the project of working out the industrial production scheme of soda water and artificial mineral water in Hungary between 1828 and 29, which had been already used by physicist in Geneva since 1798. He invented a machine which made saturation with carbon dioxide cheap. The medical professor’s friends made him utilize this procedure not for the sake of earning but because the patients in the hospital were grateful for the refreshing soda water, the artificial medical water. Soon the doctors’ veracity had been proved: a cholera epidemic swept through the country in 1831-32 and soda water – which did not diffuse the infection – brought relief and ease to those suffering. Our factory is located in Hungary, 20 km from Budapest. Adress: Hungary, 2337, Délegyháza, Bányász sor 21.